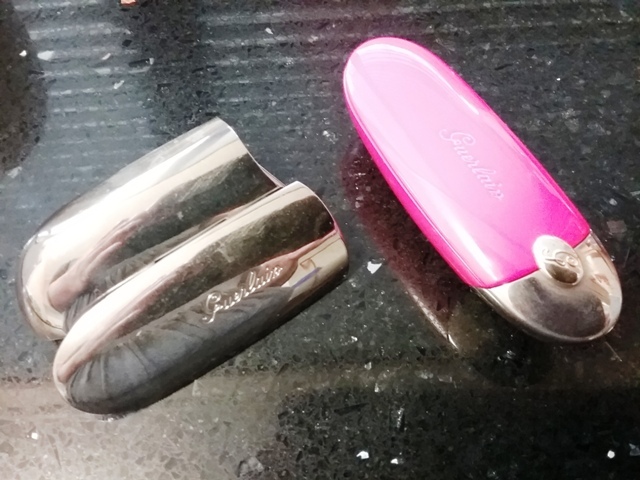 The Guerlain Rouge G lipsticks are some of my favorites in terms of formula and color, and way back when they were first introduced, Guerlain said that these will be refillable. Fast forward 5 years later (at least! 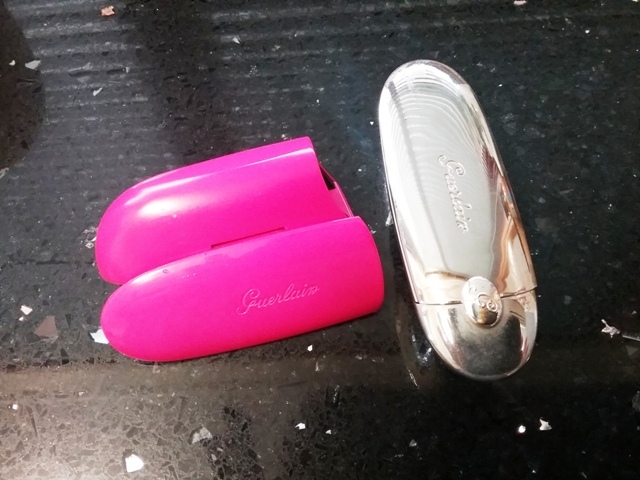 ), Guerlain make good on their word and introduced the Rouge G de Guerlain lipstick refill and, even better, Rouge G de Guerlain cases! So now you can buy the lipstick and case separately. It’s not a novel concept (Japanese brands often sell the product and case separately), but somehow since it’s Guerlain, very exciting! The cases have been flying off the shelves, but I wanted to check them out in person before buying, to see if the old lipsticks can fit in the new case. And voila, yes they do!! I’ve read some blogs mentioning that the fit is not as tight/secure as can be, but mine is absolutely tight and secure. I chose the hot pink case (Neon-ista), and my old tube of Rouge G lipstick (in Bee) fit right in there, secure and tight. I’ve tried holding the tube by either end, and it doesn’t budge. All good! So excited to see Jennifer Lawrence on the cover of Vogue’s September Issue. Girl looks awesome in what will be another iconic image from photographer extraordinaire Annie Leibowitz. Check the video too, it’s hilarious. Vogue is currently $5/year on Kindle, btw. It’s been years since I bought any magazine hardcopies – the Kindle versions are great for commutes and travel, and Amazon is always having these annual subscriptions of the fashion glossies for $5! Most people talk too much on beauty videos. Talking without much content. Then Karen hooked me up to this gal and I’ve been binge watching! Violette_fr one speaks just enough words, with a specific style and a fresh take on beauty. If you only listen to one Indonesian album, this is it. 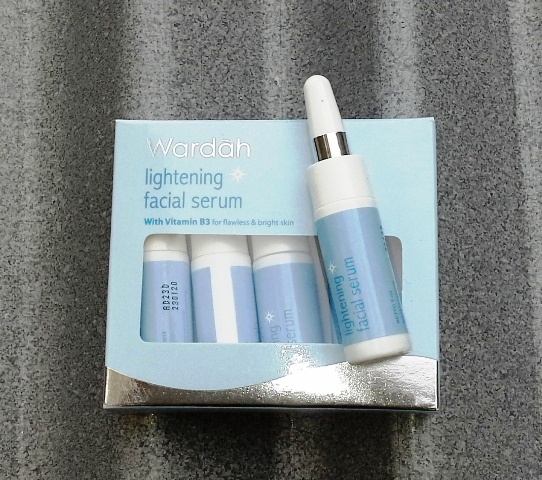 I just bought my third box of Wardah Lightening Facial Serum, so obviously this is a good one. It’s a box of 5 ampoules, each 5ml, and is marketed as containing Vitamin B3 to help brighten skin. Each of the ampoules has a twist cap opening, and the liquid content is a clear gel (not too runny) with a very faint floral scent. 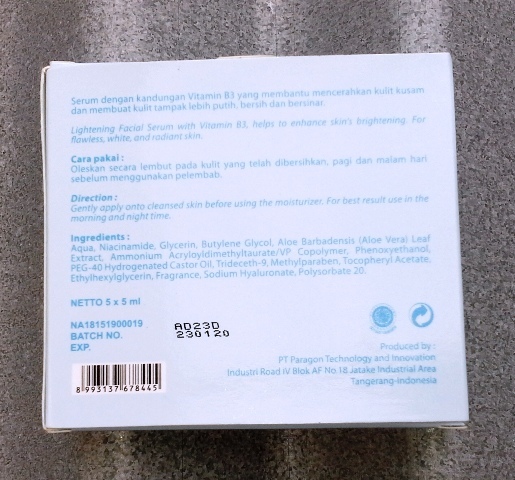 Niacinamide (or Vitamin B3) is the second ingredient after water in Wardah’s Lightening Facial Serum, and this was what caught my attention. Niacinamide is a very popular ingredient in products targeted for skin brightening or lightening, since it is touted to reduce wrinkles, hydrate, peel, AND help skin turnover at the same time, with many clinical trials and scientific research to prove the claims. You can read a bit more here, here or here, and googling will result in many more info about this ingredient. Not only that, Glycerin and Aloe are also high in the ingredient list, and both are hydrating substances. Tocopheryl Acetate or Vitamin E, and Sodium Hyaluronate, another hydrating ingredient, are also present at relatively smaller amounts (but potentially still of sufficient quantities to be effective, as the list is relatively short). Housing the Serum in small ampoules is also a smart move as it reduces contact with oxygen (therefore slowing the breakdown/degradation of the ingredients). Each ampoule of 5ml is sufficient for 4-5 applications in my experience – I use this liberally to coat my face, neck and upper chest. I use this only at night, after a thorough cleansing of my face, and the Serum is followed by a basic moisturizer to ‘seal in’ the hydration (I like St Ive’s Collagen Elastin Moisturizer). Even without the additional moisturizer, this Serum alone is hydrating enough for my oily facial skin, but I put on moisturizer on top since my neck and chest area can always use it. So, great ingredients and packaging – but what about performance? Indeed, I see the brightening impact even after the second use! After the use of one ampoule (4-5 consecutive nights), I see significant brightening and overall evening out of skin tone. I never use more than one ampoule continuously, preferring to switch around what I use to get the most benefits from different skincare ingredients. I usually take a few weeks before opening and using the next ampoule. So a box can last me at least 3 months. At a price of Rp54,000 for 25ml (less than US$5, and it is often on sale), this product is obviously a winner. Highly recommended and I applaud Wardah for making a good product (using internationally proven effective ingredient) at a price that everyone can afford! I’ve just discovered Vevo has regional playlists. Currently enjoying Vevo Espana, and discovering the latest offering from Alejandro Sanz (a duet with Marc Anthony).